As everyone knows, English loves to borrow words from other languages. But we don’t just borrow any old word; the words we borrow give us all kinds of clues about our attitudes towards other languages and their speakers and cultures. What do we admire? What do we look down on? What do we consider different and foreign? What do we feel we need additional words to talk about properly? Today’s Words of the Month are a case study in borrowing: loan words from Italian into English. We begin in the renaissance, when Italy was the banking center of Europe. English people may have borrowed money, but they certainly borrowed Italian words to get bank (late 15th c), bankrupt (1560s “broken bench”), and manage (“handle” 1560s). 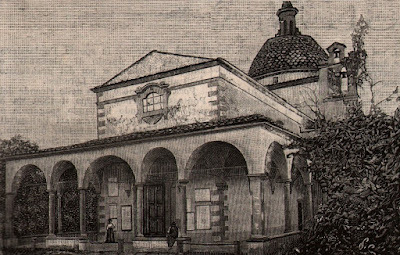 In the seventeenth and eighteenth centuries Italy had an enormous influence on the development of baroque and classical music, and English borrowed Italian musical terms wholesale. Not all borrowings are for things we admire, however. English also borrowed bandit (1590s), stiletto (1610), vendetta (1846), and Mafia (1875) from Italian. Why borrow words for crimes when speakers of English could just as easily have spoken of thieves, daggers, vengeance, and organized crime in native English words? Sometimes it puts a romantic spin on a criminal, if a bandit seems more exotic and dashing than a footpad. But in many cases, by borrowing words for crime or other undesirable elements of culture, speakers put themselves at a distance. These are Italian criminals and Italian crimes, not good, wholesome English behavior. Vendetta and Mafia entered English with the waves of immigrants entering the United States during the Ellis Island period, and remind us of some of the stereotypes English speakers held about Italian immigrants. The one area where languages almost always end up borrowing from one another is food, and through the centuries English has adopted many Italian food words along with the foods themselves. Here’s a fun surreal piece by Neil Brigham. Surrealism has broad overlap with fantasy, and this could illustrate the high-tech version of my Extraordinary Book of Doors: pictures that become portals. If only travel were so easy! 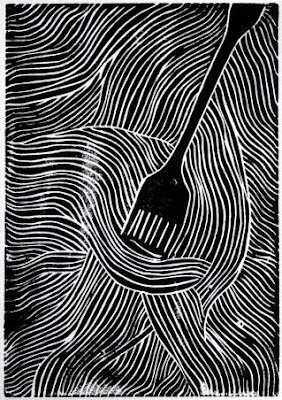 Although primarily a printmaker, Brigham does occasionally do scratchboard, and the fineness of lines on this piece make me wonder whether it might be scratchboard. Unfortunately, Brigham’s web site gives no details about individual pieces. The look is the same, in either case. It’s whimsical, fun, and a little mysterious. 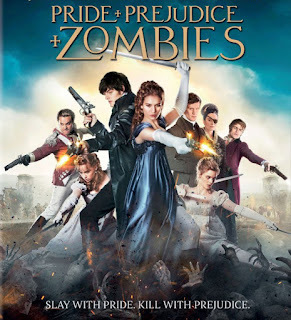 Pride and Prejudice and Zombies by Jane Austen with additions by Seth Grahame-Smith - All right, I admit that I haven’t actually read this one. I was duly amused by the title, but assumed that having seen the title, I had got the joke. If I were more interested in zombies, I might have read it anyway, but I see nothing in the reviews to entice me, despite its blockbuster success. 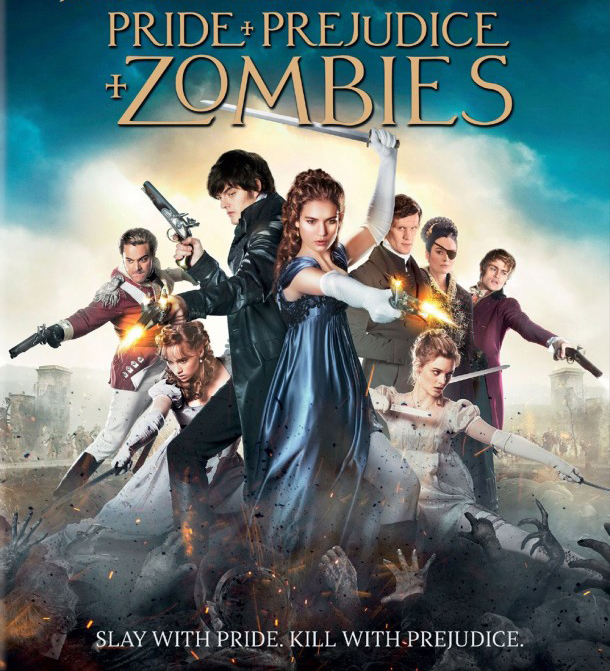 Opening line: It is a truth universally acknowledged that a zombie in possession of brains must be in want of more brains. Mr. Darcy, Vampyre by Amanda Grange - Tagline: A married man in possession of a dark fortune must be in want of an eternal wife. Mrs. Darcy versus the Aliens by Jonathan Pinnock - Tagline: The truth is out there, though it is not universally acknowledged. 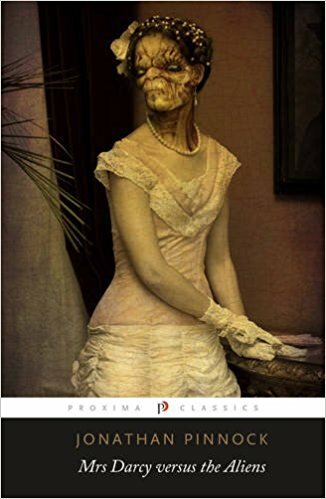 Pride and Platypus: Mr. Darcy’s Dreadful Secret by Jane Austen and Vera Nazarian - involving demons and were-creatures of all sorts. Opening line: It is a truth universally acknowledged, that when the moon is full over Regency England, the gentlemen are all subject to its curse. Pemberley: Mr. Darcy’s Dragon by Maria Grace - I confess this seems a little more enticing than the others, but my library system doesn’t seem to have it, so I’ll probably never read this one, either. Death Comes to Pemberley by P.D. James - A fine mystery, but James struggles sporadically with the Austen style for a chapter or two before giving up the unequal effort. Jane and The Unpleasantness at Scargrave Manor by Stephanie Barron - Okay, I admit this is neither fantasy nor Pride and Prejudice, being the first of a mystery series featuring Jane Austen herself as the detective. But I include it because it’s excellent. Barron does a great job capturing Austen’s voice; the historical setting is well researched, accurate (to the best of my knowledge, anyway), and intriguing; and the mysteries are thoroughly enjoyable. Pride and Prescience by Carrie Bebris - which includes cursed artefacts and something like voodoo, maybe some mind control… I confess to remembering very little about it, except that it didn’t seem to make a lot of sense and I was thoroughly disappointed. Heart Stone by Elle Katharine White - Pride and Prejudice and Dragons, which I enjoyed tremendously. The magical world is well-crafted and interesting, and the translation of Austen’s characters and plot into this magical world is generally very well done. 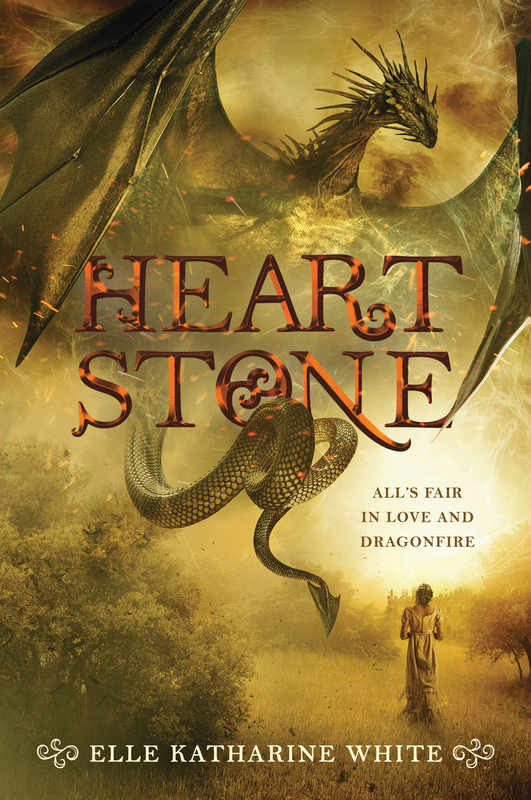 This is not Regency England with dragons, but rather a purely fantasy world so that White can make things up as she wants without any jarring historical inaccuracy. I enjoyed that White redeems several of Austen’s “villains” so that you don’t know everything about everyone ahead of time. The romantic tension dissipates a little too soon, but it’s replaced by action adventure to provide suspense for the climax and finale. Tagline: They say a Rider in possession of a good blade must be in want of a monster to slay. work. Hawkins specialized, according to the Australian Dictionary of Biography, in “modernist allegories of morality for an age of atomic warfare and global over-population.” If that gives you any additional insight into these figures, you’re smarter than I am. 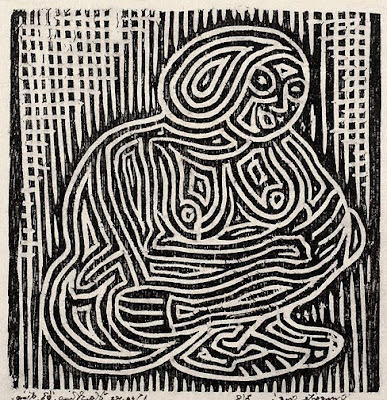 Certainly the man looks overwhelmed, but the woman looks quite content, I think. At any rate, what I do enjoy about these two pieces is their carving, simultaneously simple and busy. I especially like the man’s left foot, and the cross-hatching in the woman’s background. 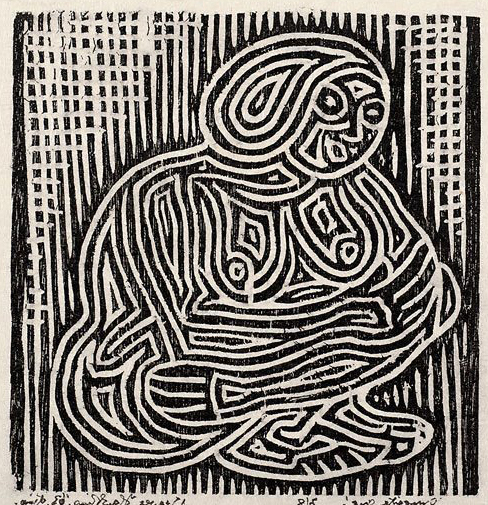 It’s very interesting how the limbs and details of the people’s bodies are both defined and disguised by the patterns of the mazy lines. 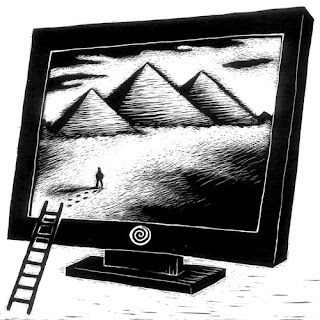 Humans love stories of lost cities. I guess it just seems so much more likely that something is merely lost than that it has never existed at all. But we have many different lost city legends, that serve many different purposes for us: Atlantis warns us about hubris, Shangri-La promises us paradise, Kitezh assures us that virtue is rewarded… and El Dorado caters to our unbridled avarice. The word El Dorado, “the golden one,” originally referred to a person, a chief of the Muisca or Chibcha people of Columbia. This king was said to participate in an initiation rite in which he was covered head to toe in gold dust, and threw vast quantities of gold and emeralds into a sacred lake as offerings. Clearly, reasoned the sixteenth century Spaniards, anyone practicing this sort of ritual had more gold than he needed. The legend grew and morphed into conviction that there must exist a city and possibly an entire empire of unimaginable wealth. (And as Han Solo would say, the Spaniards could imagine quite a bit.) 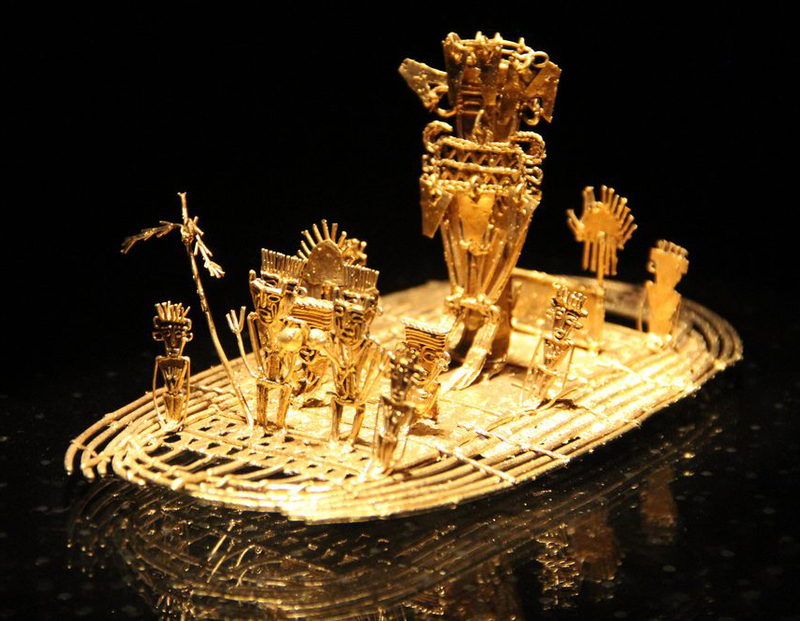 The name El Dorado morphed with the legend, and fueled centuries of greed-crazed expeditions. There are some tantalizing facts associated with the legends. Much of the search for El Dorado over the years focussed on the lake where all the gold offerings were dumped. 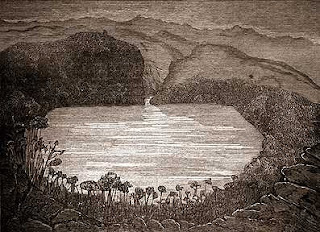 Lake Guatavita is one candidate, which was found by conquistadores in 1537. 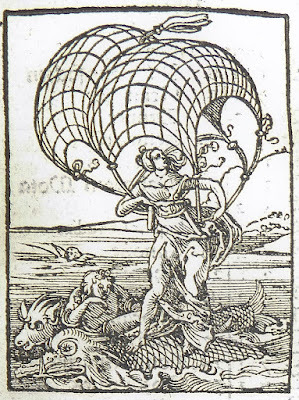 They attempted to drain the lake in 1545 with a bucket chain, and a second attempt was made by a Bogatá business entrepreneur in 1580 by cutting a notch in the rim. Each attempt recovered some gold, but not what they had hoped for. In 1898 a British firm dug a tunnel up from the bottom and drained the lake like pulling the plug on a bathtub… Except that there remained four feet of mud at the bottom, which then set hard and made it impossible to dig up anything. They recovered even less than the others. As of 1965 the poor lake is refilled (at least up to the level of the notch) and is a protected area. The other much-sought lake, Lake Parime, was believed by Sir Walter Raleigh to be the site of El Dorado (aka Manoa). It appears on many old maps, but by the nineteenth century was concluded to be a myth. Interestingly, Brazilian geologists in the twentieth century discovered evidence that there had indeed once been a large lake in that area. Possibly an earthquake in 1690 opened a fault that eventually emptied the lake completely. As far as I know, however, significant quantities of gold and emeralds have not been found at that site, either. Perhaps it all washed away as the lake drained. About a year or so ago D and I watched a documentary which theorized that the Muisca people had so much gold not because they lived in a land of gold, but because they became wealthy by producing salt which they sold to everyone else in the region. They valued the gold not as earthly currency, but as divine currency: the requisite offering to the gods. It was pretty interesting and I think it must have been “Secrets: Golden Raft of El Dorado” by Smithsonian Channel, if you’re interested. At any rate, what’s fascinating about the legend of El Dorado is that it reveals just how incredibly powerful a force for fantasy our greed is. No matter how outrageous the story, we long to believe it if it promises us “easy” wealth. Think of the effort people will go to, the lives ruined, lost, and stolen, the money wasted, the laws broken, the tyrants and swindlers followed, the archaeological artefacts destroyed, the lands despoiled… all because we just can’t seem to stop ourselves from believing in the fantasy that somewhere out there is infinite wealth for the taking. It’s certainly not our finest trait, nor the noblest use of our imaginations, but there’s no denying it’s a strong component of that infuriating mix that is humanity. 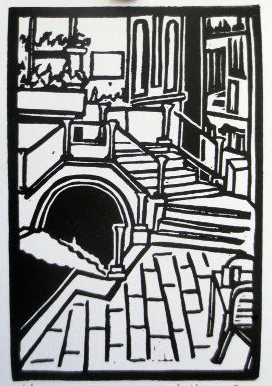 Here’s the second half of the relief block prints of Venice, Italy, showing some recurring themes, and some additional variety. We begin from a distance, with an iconic gondola looking back at the iconic skyline. I especially like the silhouette of the architecture looking like cut paper in this piece by Posterity Press. actual orientation, with the Palazzo Ducale and the winged lion pillar on the left instead of the right. 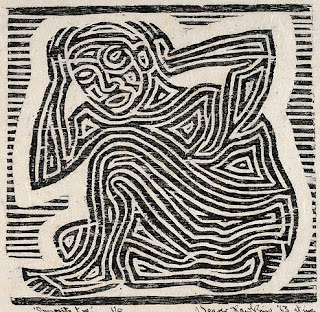 This may be evidence that the picture was copied from another; if a direct copy is used to carve a block, the whole image gets flipped when printed. 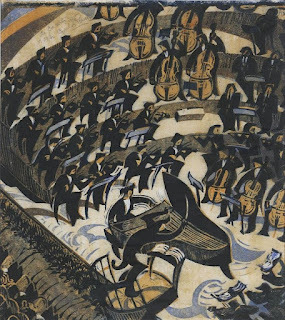 But despite its age, I think this is really quite a modern-looking piece: the elevated view, the almost Cubist flattening of the buildings and their perspective, and the gondoliers simplified into hieroglyphics. Moving in just a little closer, we see the same view in photographic accuracy and detail. This is an enormous print - I count fourteen blocks on fourteen sheets of paper joined together. It represents a procession of the doge, and you can see all kinds of people, and quite a few dogs, busy with their myriad activities. The perspective is precise, the architecture shows every brick and flourish, and the water looks quite alarmingly choppy. As if all that weren’t spectacular enough, Amman has also shown the heavens opening and some sort of divine apparition lending its countenance to the proceedings. Flying right on into the Piazza San Marco to focus on the Basilica, Frasconi’s portrait of the church is more symbolic than photographic. 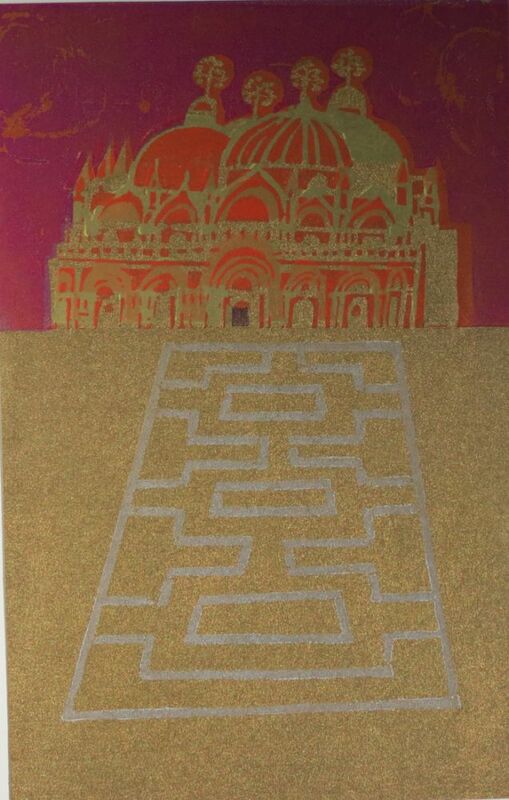 He’s used intense colors and even gold ink to highlight the magnificence of the building. The pattern on the ground is representative rather than strictly accurate, and if you didn’t know better, you’d get the impression that this building stands on its own, rather than being part of an enclosing courtyard. Focussing closer yet in this piece by Mietta, here’s a glimpse of just a section of paving, bridge, and walls. It’s one little snapshot of the city, not a grand vista, and an anonymous corner rather than one of the famous postcard locations. 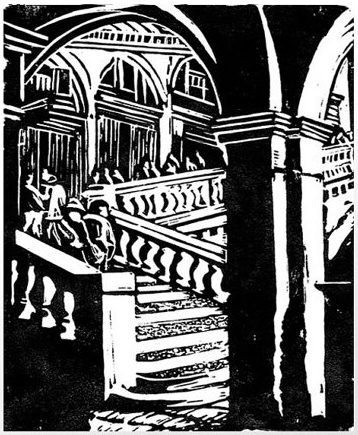 When I make block prints of famous places, I too usually try to figure out a less common view, or a way to show it that will somehow be different from the way everyone else has shown it. 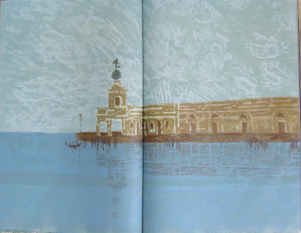 And the final piece I have for you today is an altogether different approach to capturing Venice. Instead of a single view or scene, it’s a montage of greatest hits. All different famous architectural elements are combined, collaged together, into a grand impression of Venice-ness. It becomes a celebration of pattern, and I like all the different patterns of arches and windows. 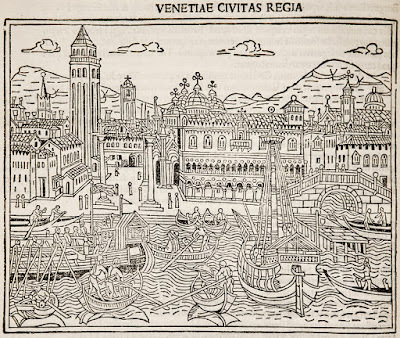 So why all the sudden interest in Venice? After years and years of dreaming, I will be visiting Venice this summer. 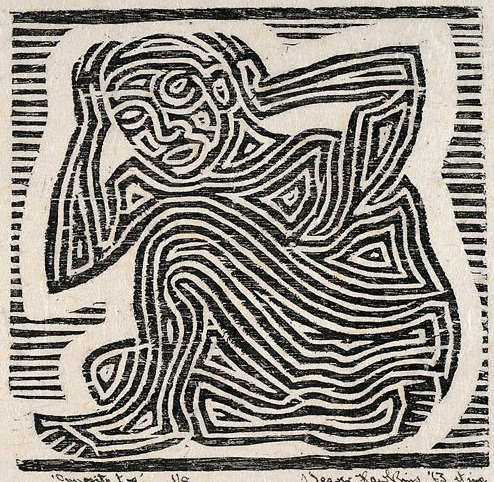 As you can imagine, I’m really looking forward to it, and hoping to come home with some photos, sketches, and inspiration for block prints of my own. 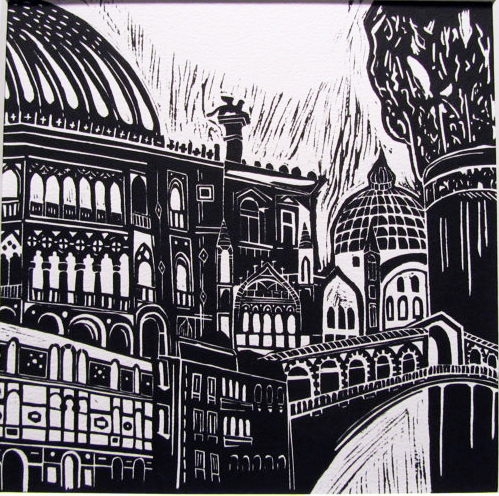 Here are a selection of relief block prints depicting the city of Venice, Italy. As a famous and celebrated city for centuries, many many artists have made images of Venice and I couldn’t settle on just a few, so I have two posts’ worth of images for you. Today’s range from the late fifteenth to early twenty-first centuries. Two early chronicles of world history go for the iconic views, understandably. 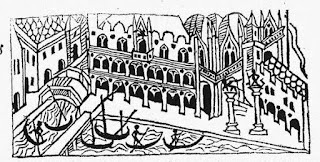 The earliest I have, from the Supplementum chronicarum of 1490, concentrates on the bustle on the water, with boats of all sizes going every which way. The piazza is relatively uncrowded, with just a sprinkling of people who are so simplified they look like bollards. I find them rather charming, like the Fisher Price peg people of my childhood. The city scenes in the Nuremberg Chronicle from 1493 are the equivalent of the photos in a geography textbook. This view of Venice makes it very clear that it’s surrounded by water, and it includes lots of excellent detail on the layout and architecture of the city. One of the magical things about Venice is just how recognizable the layout and architecture still are after 527 years! 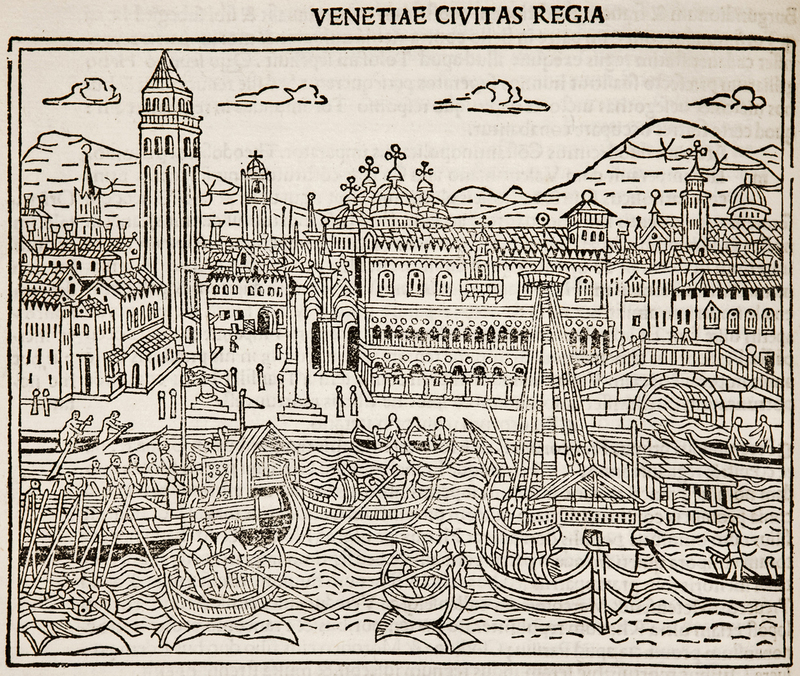 To focus in on some of that architecture, I have four images of Venetian palazzos by Santariello. The first two would have been part of Venice already when those first views above were made! In fact, entirely coincidentally, I seem to have arranged the four in chronological order. I like their bold, clean simplicity that yet retains each building’s unique characteristics. 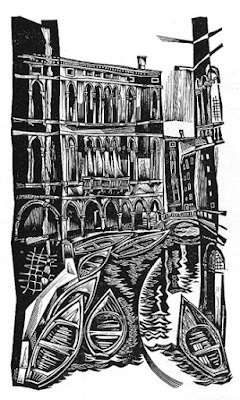 This next piece evokes Venice’s crowdedness, with buildings everywhere. 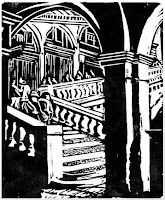 I like the light and shadow, especially on the foreground arch and balustrades. You wouldn’t know from looking at this view by Meshew that there’s water running through everything. 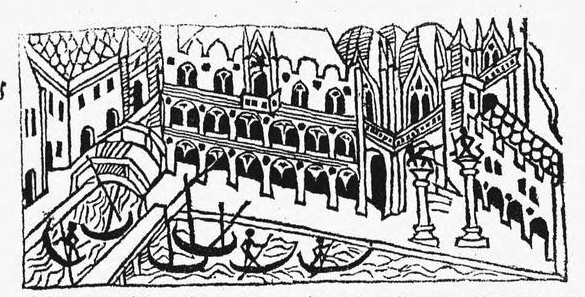 By contrast, the next piece, by Frasconi, reminds us that Venice is all about the water, floating in the lagoon like a barge. Unfortunataly this isn’t a very good image of the piece, but you can make out the reflections in the water, and I like the texture in the sky, as well. I can’t see details well enough to be sure how many blocks and colors went into this image. I’d guess four or five, depending on the paper color. And I’ll end with another canal view, by Marangoni. This one once again features crowded architecture, but with no people visible at all. I like the slightly irregular angles of things, and how the edges of the block are not straight. 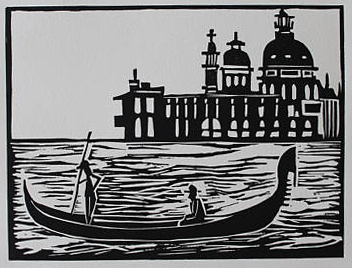 That’s all for today, but tune in next time for the second half of the selection of relief block prints of Venice. 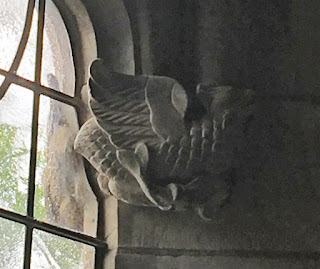 The griffin just above in the heading of this blog is based on a stone carving on one of the buildings on the Yale University campus. 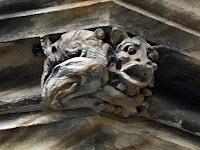 I posted last week’s stone carved creatures because I knew I’d be heading to Yale for my reunion, and had Yale’s wonderful architecture on my mind. While there I made a point of taking pictures of some of the marvelous fantastical animals I spotted. I do have to apologize for bad photos - distance, poor light, and phone camera don’t help, and many architectural carvings are not very accessible. Still, I hope you can get an idea of the whimsy and creativity the anonymous stone carvers put into their work. I say anonymous - presumably their names do exist somewhere, on payroll records deep in the college archives, as most of these carvings date from the nineteen-thirties, not the medieval era! 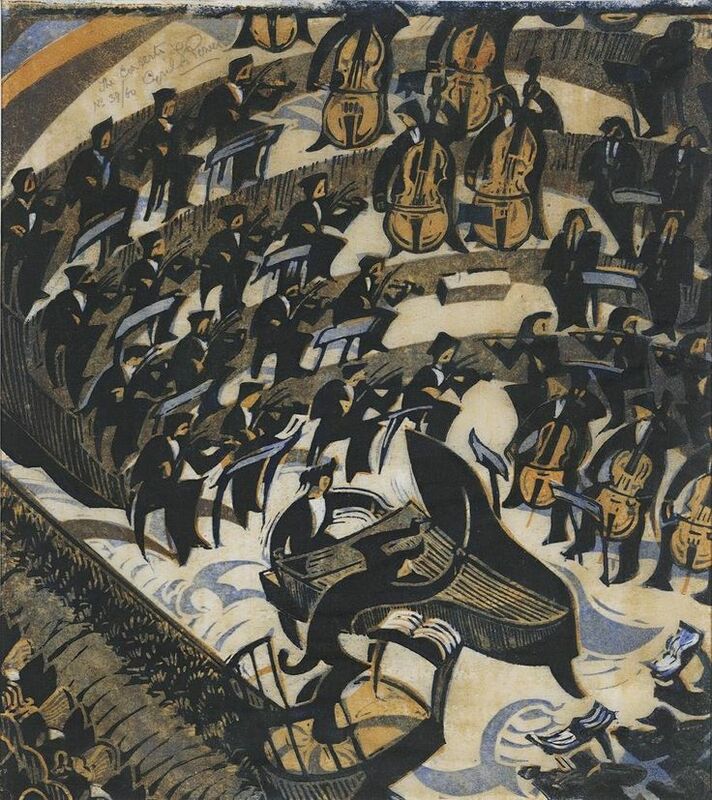 But I could not readily find any information about the artists. So, first of all I have two views of my favorite little griffin, from the back gate of Calhoun/Hopper residential college. I love its scaly tail and feather-circled eyes like daisies. It looks so sweet! 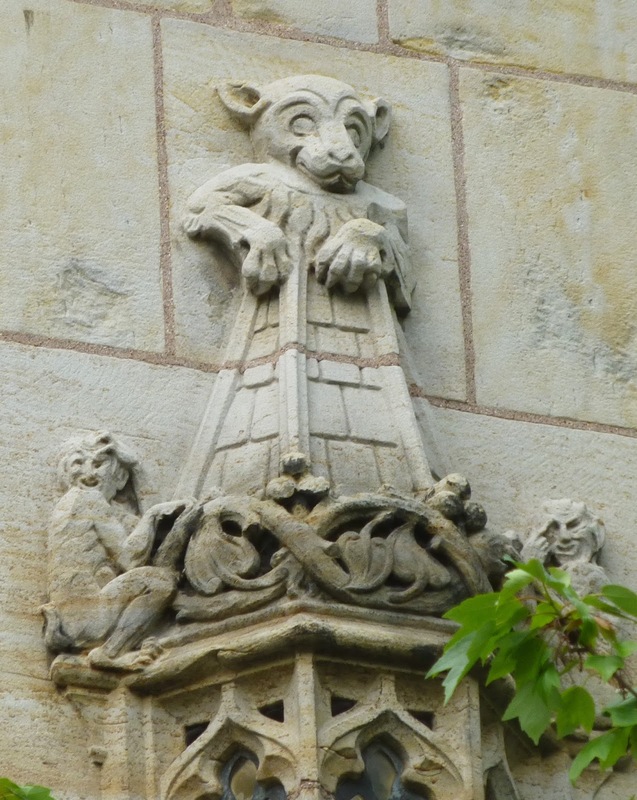 From Davenport, another residential college, I give you an indeterminate monster with a frog mouth, leonine haunches, and intense eyes - definitely not sweet. 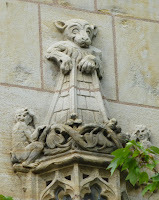 From Trumbull College comes a sort of King-Kong-wannabe: something giant and monkey-like apparently climbing a steeple. Although the other monkeys down below seem to be pantomiming that they think this guy is crazy, it seems perfectly pleased with itself. These bird-headed beings can be found on the arches over the entrance to the Law School. What’s the connection between studying law and being a bird-brain? Are the students wise as owls, or do they just parrot back their lessons? I can’t say, but I do know that some artist was having fun. I’m especially sorry not to have a better picture of this monster from the Art Gallery. It was in a dark stairwell and there wasn’t much I could do to adjust my position or the lighting. 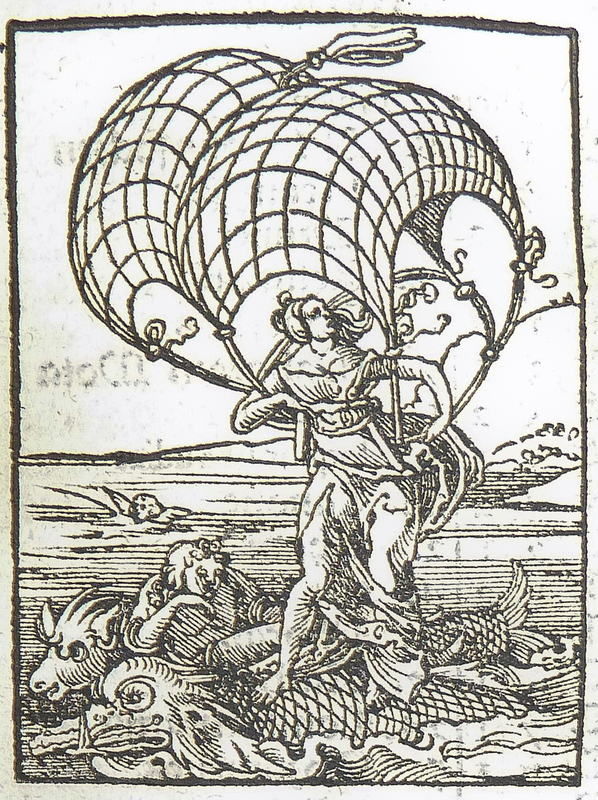 At any rate, it appears to be a sort of fish-tailed griffin-ish thing, which is quite delightful. 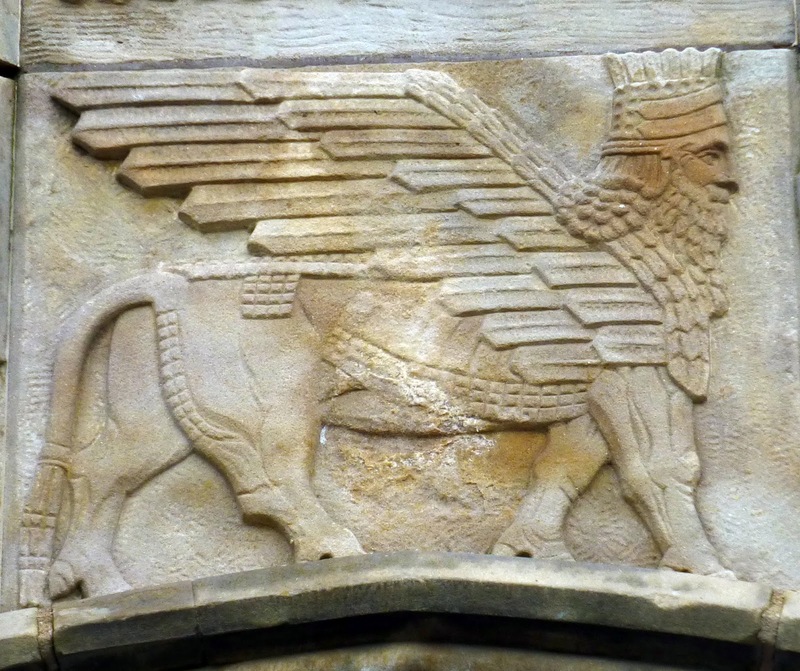 And finally a traditional lamassu, an Assyrian protective diety, often carved guarding entrances. 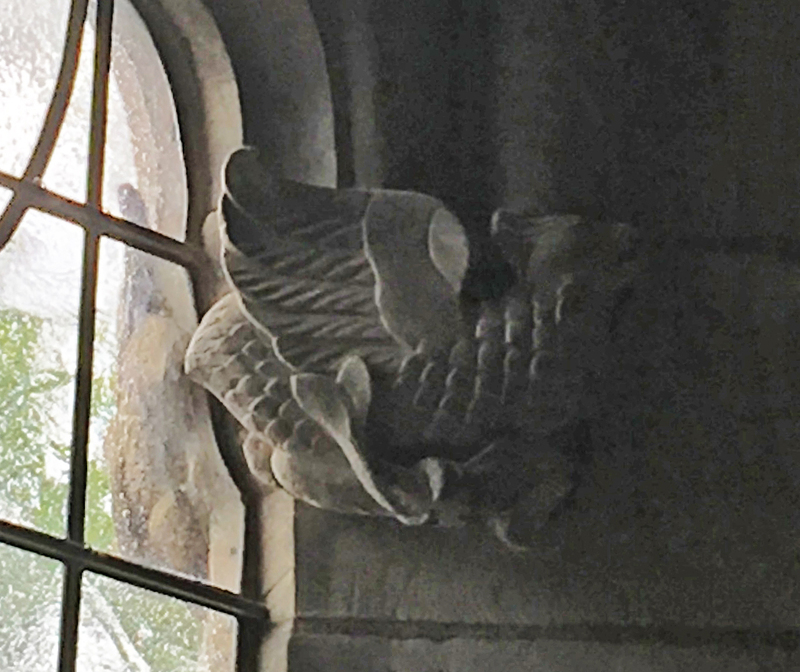 This one comes from above the entrance to Sterling Library, and can be attributed to the only named artists I could find: designed by Lee Lawrie (USA, 1877-1963) and executed by Rene Paul Chambellan (USA, 1893-1955). Unlike this post’s other creatures, this was not decorative whimsy, but was part of a carefully planned symbolic array celebrating the scholarly achievements of ancient civilizations around the world. (The Sterling entrance relief also includes inscriptions of texts representing each writing system, which I think is pretty awesome.) 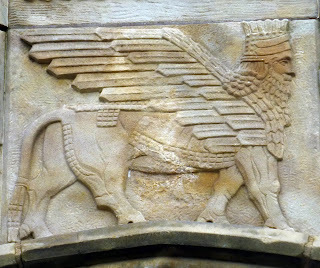 You can see the Art Deco influence in his very geometric wing feathers, unlike some of the more Gothic-styled carvings. 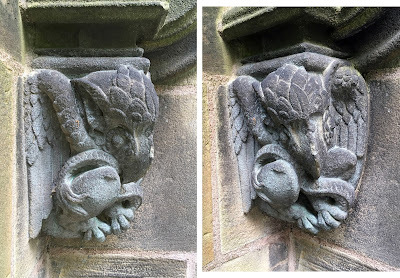 I’m sure there are many more mythical creatures at Yale, as there were plenty of buildings I didn’t visit and corners I didn’t inspect, and many of these carvings are tucked away in relatively out-of-the way locations. But I hope you enjoy these, and appreciate the creativity, humor, and attention to detail that went into this work, as well as the obvious delight in fantasy creatures.